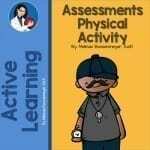 Physical Activity assessments are numerous and needed to indicate the effectiveness of interventions or programs. The list below was originally compiled for Physical Education for Progress Grants. Select from the list below when measuring physical activity program interventions. SOPLAY is a validated tool for directly observing physical activity and associated environmental characteristics in free play settings (e.g., recess and lunch at school). SOPLAY provides objective data on the number of participants and their physical activity levels during play and leisure opportunities in targeted areas. Separate scans are made for males and females, and simultaneous entries for contextual characteristics of areas including their accessibility, usability, and whether or not supervision, organized activities, and equipment are provided. The predominant type of activity engaged in by area users is also recorded (e.g., basketball, dance). Recognition of the importance of physical activity has reached a new height in America. In fact, physical activity was recently named as one of the 10 leading health indicators in Healthy People 2010.1 Consequently, the imperative to evaluate our physical activity programs is greater than ever. Physical Activity Evaluation Activities from the CDC. The physical activity guidelines for children and adolescents aged 6 to 17 focuses on three types of activity: aerobic, muscle-strengthening, and bone-strengthening. Each type has important health benefits. This documents provides targets to aim for in your data gathering process. This project was sponsored by funding from the United States Air Force administered by the U.S. Army Medical Research Acquisition Activity. Check out the PA Assessment Section of this website for assessment tools. PASS is a free, user-friendly, web-based, 8-item tool that assesses and increases awareness of evidence-based physical activity practices at elementary schools. PASS increases awareness of evidence-based PA practices (e.g., PE, recess, activity breaks, active transport). We reviewed evidence-based literature, created PASS, revised it on reviews of teachers and administrators, and developed an on-line version.